You’d be foolish to miss out on HarbourView Inn’s April Fools’ flash sale! 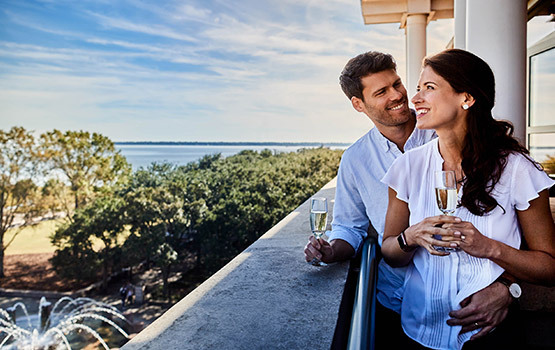 For 72 hours only, enjoy 20% off your Charleston getaway, PLUS a bottle of champagne on us when you book a new reservation. Take advantage of these rare springtime savings for travel now through September. Indulge in complimentary wine & cheese. Enjoy the sea breeze on our rooftop bar. Discover gorgeous views of the harbor and downtown Charleston. Springtime in Charleston strikes that perfect balance of not-too-cold and not-too-hot. Comfortably walk the Holy City and admire the flowers in bloom. Charleston is a foodie’s paradise. Chefs throughout the city use local, fresh, seasonal ingredients—some of which are only available in the spring! Spring is a time of growth and energy. There's never a shortage of festivals, gardens, and tours to experience this time of year. Terms & Conditions: This is a limited time offer available for new reservations booked by 4/3/19 for travel through 09/26/19. Not applicable to groups, corporate-negotiated, or third party rates. Cannot be combined with any other promotion or offers. Subject to availability and blackout dates. Taxes and gratuities are not included.